Plastic C, J, U, etc. Contact Jay, he is your Plastics Profile & Tubing Specialist. If it’s a plastic profile or tubing he can deliver it. Jay also has U-Channels, Edging, H-Channels, Connectors, Angles and Tubing in standard and ready to ship. Looking for a custom plastic profile? Need a fast quote on standard or custom plastic profiles? Jay would be happy to help! Call for a hassle free quote. With over 25 years experience, Seagate Plastics is a trusted manufacturer of quality standard and custom profiles and tubing. Contact us today, if you don't find what you need, chances are we have it. Seagate Plastics can also create your custom plastic profiles and tubing. Our capabilities will save you valuable money. Jay, the plastic profile specialist, has saved his customers over $1 million. There are many Standard Plastic Profile Shapes when using extrusion as a method to process plastics. Simple round pipes and square shapes are common Custom Plastic Profile Shapes. More complex standard Plastic Profile Shapes, such as tracks and profiles, are also commonly produced by extrusion molding. Solid extrusions can be produced with a large thickness. Wall thicknesses of hollow extrusions typically vary from 0.005 in. to around 0.3 in. The Length is typically anywhere between 10 ft and 100 ft., although theoretically if you had enough room and material you could produce an extrusion with an infinitely long length, resulting in more Custom Plastic Profile Shapes. Plastics extrusion used to make Custom Plastic Profile Shapes, along with pipes, hoses, drinking straws, curtain tracks, rods, and fibers. The machine used to create standard Plastic Profile Shapes and extrude materials is very similar to an injection molding machine. A motor turns a screw which feeds granules of plastic through a heater. The granules melt into a liquid which is forced through a die, forming a long 'tube like' shape, which aides the process in creating Custom Plastic Profile Shapes. The shape of the die determines the shape of the profile. The extrusion is then cooled and forms a solid shape. The profile may be printed upon, and cut at equal intervals. The pieces may be rolled for storage or packed together, resulting in Custom Plastic Profile Shapes. 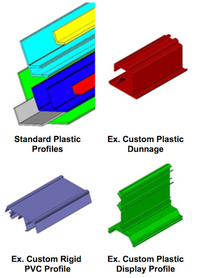 standard Plastic Profile Shapes that can result from extrusion include Angles, Connectors, H-Channels, U-Channels and Edging, and Snap-On U-Channels ,j-channels, guides and tracks. The process for Custom Plastic Profile Shapes is this: In the extrusion of plastics, raw thermoplastic material in the form of small beads is gravity fed from a top mounted hopper into the barrel of the extruder. Additives such as colorants and UV inhibitors can be mixed into the resin prior to arriving at the hopper, to later create Custom Plastic Profile Shapes. Continuing the process of creating standard Plastic Profile Shapes, the material enters through the feed throat and comes into contact with the screw. The rotating screw forces the plastic beads forward into the barrel which is heated to the desired melt temperature of the molten plastic. In most Custom Plastic Profile Shapes processes, a heating profile is set for the barrel in which three or more independently controlled heaters gradually increase the temperature of the barrel from the rear to the front. Extra heat is contributed by the intense pressure and friction taking place inside the barrel, creating standard Plastic Profile Shapes. In most Custom Plastic Profile Shape processes, cooling fans are present to keep the temperature below a set value if too much heat is generated. Thorough mixing of the molten plastic occurs during the creation of Custom Plastic Profile Shapes. There are many different screw designs; some made to enhance mixing with special ridges in the middle section of the screw to cause turbulent flow. At the front of the barrel, the molten plastic leaves the screw and travels through a screen pack to remove any contaminants in the melt. Continuing with the standard Plastic Profile Shapes process, the screens are reinforced by a breaker plate since the pressure at this point can exceed 5000 psi. After passing through the breaker plate, the molten Custom Plastic Profile Shapes plastic enters the die. The die is what gives the final product its profile and must be designed so that the molten plastic evenly flows from a cylindrical profile, to the product's standard Plastic Profile Shapes. Uneven flow at this stage would produce a product with unwanted stresses at certain points in the profile. These stresses can cause warping upon cooling. Almost any Custom Plastic Profile Shapes imaginable can be created so long as it is a continuous profile. The product must now be cooled and this is usually achieved by pulling the standard Plastic Profile Shapes through a water bath. Plastics are very good thermal insulators and are therefore difficult to cool quickly. Compared with steel, standard Plastic Profile Shapes conducts its heat away 2000 times more slowly. SeaGate Plastics is your best choice for made in America plastic extrusions and fabricated plastic components. With a 9001:2015 ISO Quality Certification, we deliver High Quality Cost Competitive stock shapes and custom plastic extrusions on a timeline to fit your needs. Whether you’re looking for an existing plastic stock shape, plastic custom extrusion, plastic custom injection molding, or plastic CNC machined sheet, SeaGate Plastics has the capabilities to keep you growing.